So, what is packed SWF? You can see single SWF showing a text. But you can’t reach a code showing it with a classic approach – through the decompilers. I should mention you’ll not reach any resources (Bitmaps, Sounds, Fonts, etc) via decompilers if they will be there too, because target SWF is placed inside of SWF you have and usually it is encrypted. This kind of packing could be achieved with simple Flex [Embed] tag. Dynamic means unpacking while target SWF is run in Flash Player (FP). As FP can’t play packed SWF as is, it should be unpacked and decrypted into the memory before loading (as example, with Loader.loadBytes()). More important, it will be in the memory all the time while it’s running to allow FP properly display end execute it. That’s our chance to get it! There are two common ways to do it. There are several tools for it available both free and paid. One of most advanced is a SWF Revealer, free tool for the ASV licence owners. It could bypass domain checks (which will prevent SWF to unpack and decrypt) in some cases and force SWF to load and decrypt target SWF. Also you may find some other tools for dumping on the web using google. For search you could use any Hex editor supporting RAM editing\viewing. If you’ll try to search for packed SWF in the sample file I linked before, you should start from searching the FWS signature (uncompressed SWF) – just search for the ‘FWS’ string in the Flash Player’s (or Flash Player plugin\browser with SWF running in it) process because FP decompresses SWF before executing if it was compressed. If you’ll search in a browser, be careful and close all other tabs with SWFs to decrease amount of the false positives. Usually, you’ll find not only one signature entry, because FP contains other internal SWFs as well, like SWF showing hint how to exit from the fullscreen mode. So if you’re not sure, I recommend you to check all found entries. Well, what to do with found signature you’ll ask? How to validate it, how to know, where is the end of the SWF? This is a signature for the one of the SWFs found in the FP memory (accidentally it’s a signature of the target packed SWF =) ) by looking for FWS string. 00 00 04 DB in hexadecimal and 1243 in decimal. Let’s measure this 1243 bytes starting from the FWS signature. Please, note that address where FWS is placed in memory is not the same on different OS and hardware. Now we see our SWF in memory really ends at 053DD4FB and we can select all bytes from 053DD020 up to 053DD4FB and copy-paste them into the new SWF file. After making this with all suitable FWS entries you’ll, you’ll have target unpacked SWF file in one of the saved SWFs! Now you should be able to decompile it as usual and look into its sources or resources. Some protections are trying to resist SWF dumping by generating many fake FWS headers, trashing a memory with them a bit. So you should double check if header has valid length and how it looks at all. Experienced in reversing people (like me :p) could say if header fake or not just looking on it and on several tens of bytes after the header. Sometimes, packed SWF will not be decrypted and loaded into the memory because of different cases. As example, packer’s loader could check current domain or some kind of the license file before unpacking SWF. In this case you’ll need to patch that checks (as example, with bytecode disassemblers like Yogda or RABCDasm) or provide needed files (probably with crypto keys for decrypting) to make SWF run and unpack in memory. Static means we don’t need the SWF to be executed in FP to unpack. Static unpacking could be very difficult because of many possible safety precautions of the packer developer. There are many ways of making static unpacking painful and very long. 2 – Decompiled AS or abc bytecode of packer loader. Use available tools to achieve it (ASV, Adobe SWF Investigator, SWiX, etc). How to find DefineBinaryData tag in the SWF? Well, some tools, like ASV will point you to that tag with ease and allow you to save it as binary file. Also it could be found by hands, with different tag-reading tools, like mentioned before Adobe SWF Investigator. To get data from DefineBinaryData tag with Adobe SWF Investigator from the sample file I linked above, just open the file, go to the Tag Viewer tab, select DefineBinaryData tag and press Dump To File button. Sometimes there could be numerous fake DefineBinaryData tags inside, just to make your life harder. To find the desired tag, you should look inside the packer’s loader code and track down where is the embedded SWF is created to be decrypted and loaded. Where SomeClass is type of Class extending the ByteArrayAsset class. Let’s look at the sample SWF loader code and look for something like this. So, we should look for the class with name ending on “_content” and extending the ByteArrayAsset class. To get which DefineBinaryData tag is linked with this class, we should look into the SymbolClass tag and search there for a record with found class name “MainTimeline_focus_loader_content”. Remember idref value. This is a desired DefineBinaryData tag id! Now go and search the DefineBinaryData tag with id = 1 – that tag will be needed one, so we can just dump it in a file and continue unpacking. Why I asked you to remember the idref value instead of class name? That’s because in case loader AS will be obfuscated, it could be really hard to work with class name. If you’ll be a lucky one, that data dumped from the DefineBinaryData tag will be the pure, not encrypted SWF, and unpacking will be finished. But in most cases data is encrypted and you should reverse engineer the packer’s loader code and make own decryptor. All we need to decrypt file from the DefineBinaryData tag is just xor each byte of it by 55. That’s all. Now you could write decryptor, decrypt SWF and decompile it to see the desired source code. And pray this decrypted swf will be your target swf, not the another one with packed swf inside haha! Sometimes packers uses the Russian Matreshka doll approach to hide target swf and other techniques to make static unpacking harder. Anyway, dynamic unpacking will beat all of them. Remember – in Flash world, nothing only variables names can be hided from the true professional with high motivation level. Any questions, ideas, comments? Feel free to leave it below! i hope you can see my post. i have been readed all of you article about swf security. and now, i have a question about alchemy : is there any way to analyse algorithm which is compiled by flashcc or alchemy, or is it possible to export abc codes which is compiled by flashcc or alchemy to swc to use? i search this question by google, but found nothing. could you talk abount it? thank you! Hey, sorry for a such late reply. Yes, it’s possible to decompile and analyse flascc \ alchemy opcodes with different tools. Not all tools support them though. thx, is there any article or tools can analyse flascc \ alchemy opcodes? i try to decompile flashcc with action script viewer, but the result scripts are unreadable. No, didn’t saw such article. Are you using latest ASV version. Latest version works great for me and decompiles flascc opcodes correctly. Hey, why you decided it can’t be unpacked? Which step of unpackage process you can’t bypass? Hey , Thanks for the comment. 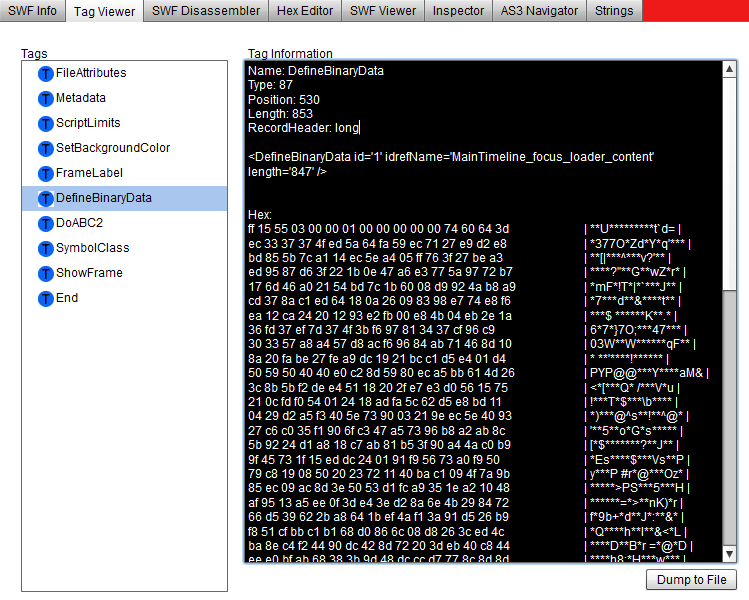 I opened the SWF in hex editor. Ah, that’s fine, just copy all the available bytes. If I just copy all the bytes from the first SWF into new SWF I just get the original first SWF and not the crypted SWF file that is inside the main SWF file as in the dynamic unpacking.. I see your problem now. You just find the original swf loaded in memory and dump it, which obviously results in the same swf. Instead, you should try looking in FP memory encrypted swf which is loaded by the original swf. To do this, just dump every swf with size ~ of the original swf size. You should be able to find swf with size 06 DB D5 after all which is swf you’re looking for. Also please note, original (loader) swf has some specific code you need to re-implement in your own loader or in dumped swf (something about array prototype). Otherwise dumped swf may just not work. what need to do after this? “To get data from DefineBinaryData tag with Adobe SWF Investigator from the sample file I linked above, just open the file, go to the Tag Viewer tab, select DefineBinaryData tag and press Dump To File button.” ? Hey, not sure I understood your question. u got any other tutorial on how to do with swf file ? like the tutorial? You actually should look at the DefineBinaryData tag contents you dumped. It could be clean swf (starts from CWS, FWS, ZWS) or something encrypted. In second case look for the decryptor in the SWF you got DefineBinaryData contents from. Please, try to use Google Translate to translate article to your native language. And use google itself to search for additional info on SWF format and AVM specs. Hi! BinaryData may contain different valid data, like FLEX skins for example. In your SWF there are JSON configs stored as BitmapData tags. They are used in wom.model.domain.JsonPopulatedDomainInfo class. Nothing extra special here. Thank your for this good explanation. How can I fake the swf header information and pack the file again? I don’t want metainfo tags like: created with adobe CS5. You could just delete the MetaData and ProductInfo tags from the SWF. Dynamically dump swf from memory not easy too. Sometimes they create multiply (10000 or more) fake swfs (size some Kb) in memory. Nice writing. There is a tool called swf-reader can also extract swfs from RAM. And for manually dumping, I once used the HxD Hex Editor. Thanks for your comment! There are many free and shareware tools created to dump swfs from memory, including SWF Reader, it’s definitely nice and useful tool for SWF inspection and editing!